DESCRIPTION: This is a very welcome addition to the published pool of knowledge for the Peninsular War and general warfare to the 20th Century. 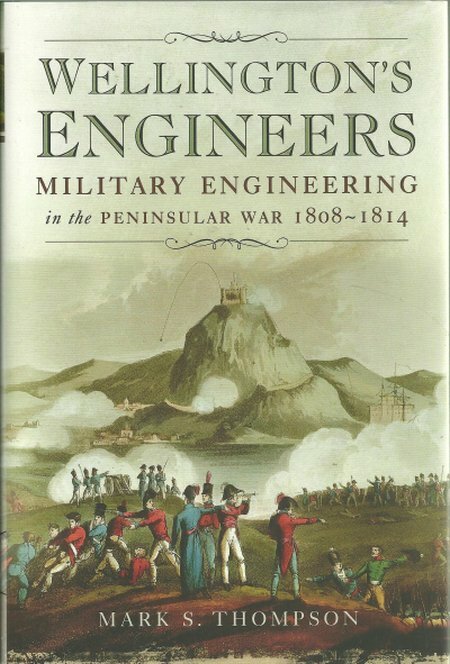 Very readable and well-supported by images, This is the first book to specifically cover military engineering during the Peninsular War by the British Army. A must-read book for all interested in land forces at war. Military engineering, certainly covering warfare before the Great War, has received virtually no coverage beyond a few brief mentions in books covering other aspects of warfare. Of course the military engineer lacks the romantic images conjured by columns of cavalry, pennants flying, or columns of marching troops with their bands. It lacks the stirring images of ‘squares’ and canon with attacking cavalry, through the fog of gun-smoke. However, the military engineer has been a vital component of every army for millennia. Reading this book will show how little, and how much, changed in the two millennia since Roman military engineers changed the face of the known world with their arrow straight roads, fortifications large and small, and the work of erecting temporary defences when a Roman army halted for the night. The Rifles may have received coverage beyond their numbers, as Special Forces, giving the mass of the British Army in the Peninsular a real edge with their long range marksmanship, undertaking reconnaissance and targeting French officers from beyond musket range. Wellington’s Exploring Officers have also received more coverage than their numbers but, like the Rifles, they did vital and exciting service. So why not give the engineers their due in making Wellington’s victories possible. Wellington’s engineers were required to provide the means to march the British Army across what was often very difficult terrain. They were also need to provide methods of command and control, build defences to deny access by the enemy, and to provide all of the works and services required for siege works and for forcing breaches in enemy defences. That was vital work and the British Army was of little value without these essential services. Some of the fortifications, roads, bridges and other buildings have not just served a short immediate service, but survived to this day. In places the battlefields are now only marked by these structures. These were the large works that were built in stone to protect high value resources and to guard or traverse key geographic features. They cost much, required much labour, and took time. What is no longer there as testament to the sterling service of military engineers are the many campaign roads and temporary bridges that were built everywhere that Wellington marched his men. Rivers were spanned by pontoon bridges with their wooden decking. Once an army had made the crossing, the bridge might have to be dismantled and moved to span another watercourse. Where a temporary bridge was needed through a campaign to maintain supply lines, it might remain for many years before decaying or being replaced by a permanent stone structure to serve the local population. Similarly, temporary fortifications were thrown up from time to time and few of these survived long, although the trained eye might see their remains. Laying siege to a town or enemy fortifications was an essential part of warfare in Wellington’s campaigns. Some sieges took much time to conclude and required a complex ring of trenches and gun emplacements. By Wellington’s era, the forcing of a breach was most frequently achieved from a safe distance by artillery. Heavy siege guns had to be carefully sited beyond the range of the enemy guns, although this was not always possible because large fortifications might also mount heavy guns with increased range. The siege batteries would then target chosen points on the enemy walls and pound away for days before creating a break that the ‘forlorn hope’ could attempt to climb through, followed by the main army. However, engineers were still required on occasion to tunnel under enemy walls and either bring them down by lighting a fire, as Roman engineers had once done, or more frequently to place explosive in the tunnel to destroy the foundations and bring down the wall above. Military engineers were often called upon to repair equipment and weapons because the army was beyond any other workshops. The military engineer has always been a flexible and generous technologist, his services in this area increasing as military technology developed. The most obvious communications works performed by the military engineer were in the construction of bridges and roads. Some roads of necessity built quickly and crudely, little more than cleaning scrub and blasting or filling obstacles to create a tactical road. This type of road was built crudely because it was needed very quickly and it often had to be built as quietly as possible to avoid alerting the enemy to the route of a new attack. However, engineers also built other communications systems and Wellington made great use of semaphore towers. These were built in several ways. The more permanent structures were stone towers and some were adaptations of windmills and church towers. A number of these have survived to today, although not necessarily obvious because the semaphore arms have long gone. Towers might also be temporary, built as the army advanced and, on occasion, built ahead of the advance. These towers made as much use of local terrain as possible and hilltop towers were usually no more than a supported wooden post, holding the semaphore arms. The author has demonstrated thorough research and covered all of these typical military engineering works. The text reads well and the illustration supporting it is extensive. Much illustration and tables is spread through the body of the book, but there is also a very good photo-plate section that blends reproductions of paintings and drawings with modern photographs of surviving structures. Together this makes a fine study of the science of Wellington’s engineers.